The benefits of veneers include cosmetic improvements to discolored teeth, chipped teeth, and crooked teeth, and an improved smile and self-confidence. Veneers are natural in their appearance, stain resistant, and are an easy procedure available right here at Polish Dental Center from Drs. Jamison and Davis. Veneers are thin, custom-made shells made from tooth-colored materials (such as porcelain) designed to cover the front side of your teeth. They are very effective at eliminating staining, reducing gaps, and even correcting the shape and size of the teeth. 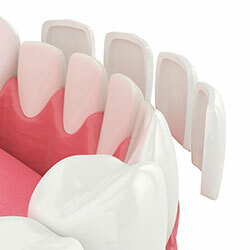 The treatment process for veneers usually only takes a few weeks. Your first appointment at our Lilburn, GA dental office involves taking photographs, X-rays, and impressions. We’ll also make models and shape the teeth if necessary. We then take the time to create a wax template and a temporary veneer so you can test the shape, color, and aesthetics. This is an important step, as it allows us to make even the slightest changes prior to your permanent veneers’ creation. We suggest treating your veneers the same way you would treat your original teeth: with routine brushing and flossing, the use of non-abrasive fluoride toothpaste, and visits to our Lilburn, GA dental office for twice-yearly dental cleanings and exams. Veneers can resist staining from coffee, tea, red wine, and tobacco, though we recommended that you avoid excessive exposure to these substances to maintain the beauty of your veneers for the long term. Drs. Jamison and Davis can enhance your appearance with a beautiful smile. Contact our Lilburn, GA dental office today to schedule an appointment at Polish Dental Center!